What if someone told you that you’re not who you think you are? Who you’ve been brought up and lived your whole life as? That’s the central premise behind Amanda Jennings’ In Her Wake. The story starts, in a way, with a ending. Bella Campbell is an only child, brought up by her doting mother Elaine and her father Henry in an old vicarage in Oxfordshire, barely seeing the outside world except for their annual holiday to the Cotswolds. So. At the most basic level, this is a story of family dynamics, secrets and relationships. The fears that face parents when something endangers the safely and wellbeing of their children. The catastrophic sense of loss and sadness when someone is taken from us. But it’s so much more than that. In Her Wake is a complex, layered tale of identity and control – husbands controlling wives, wives controlling husbands, and how it feels to break those shackles, to become your own person and not who everyone else is insisting that you are. At the beginning you wonder what Bella sees in her controlling, older husband David. He’s genuinely awful to her (I got very cross with him from very early on in the book), but it seems that she just can’t see it. He clearly feels he’s doing the Right Thing, and has an absolute, unshakeable conviction that he knows best. Similarly with Elaine and Henry, Bella’s parents. Each feels they do what they have to do, with us the audience on the outside wondering why they can’t see what we can. It can be all too easy to write people off as bad, but things are never black or white. Amanda Jennings has a phenomenal gift for story, layering real depth onto each and every character in the book. She also has a wonderful ability to bring you into a place – I’ve been to Cornwall many times over the years and could almost feel myself back there with Bella, with the sand between my toes on the beach and the waves crashing nearby. It’s hard not to say too much and spoil the story. You really need to go on the journey with Bella to find out who she is, who she was, and who she ultimately wants to be. It’s quite a trip. I promise you won’t be disappointed. 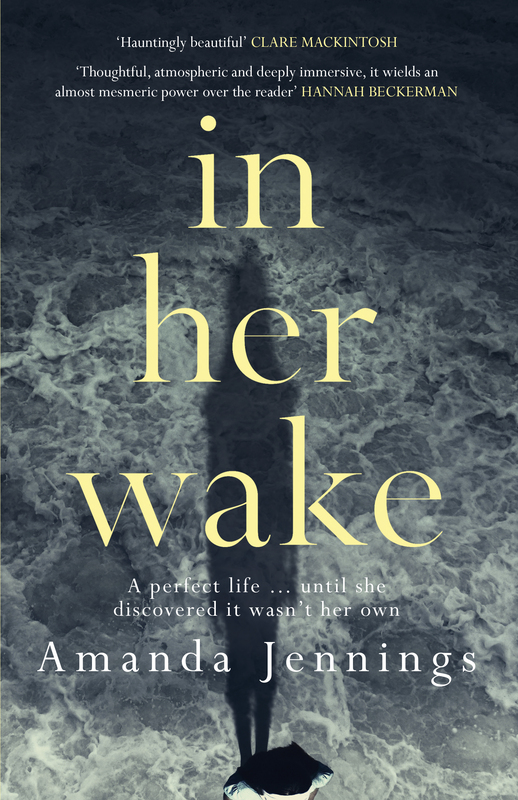 In Her Wake is published by Orenda Books and is available now in paperback. And what’s more, I have a copy to give away! Tell me about your favourite beach, either in the comments below or on twitter. Use the hashtag #InHerWake and don’t forget to tag me (@dakegra). I’ll pick a winner this Friday (8th April 2016). Good luck! 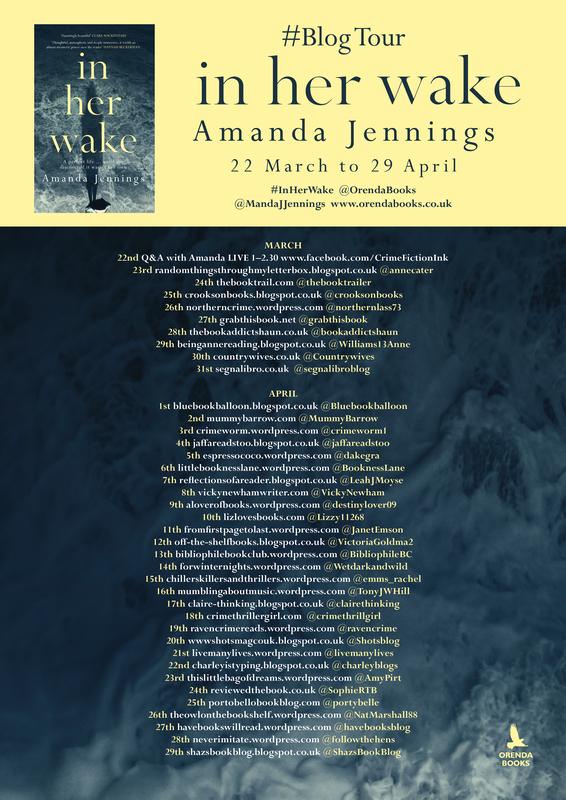 Many thanks to Karen (@OrendaBooks) for the review copy, and to Amanda Jennings (@MandaJJennings) for writing it! As ever, the opinions are entirely my own. The blog tour continues tomorrow with Wendy at Little Bookness Lane with @BooknessLane. I don’t think we got as far as Bournemouth beach last time I was down that way. Studland Beach was nice! My favourite beach would have to be Nefyn in N Wales. We used to go there when I was little so it sums up summer holidays to me. oh, it’s beautiful up there. If you go a bit further along, Aberdaron beach is also fabulous. Can get a bit breezy though out on the Llŷn Peninsula! I live near a beautiful beach St Brelades here in Jersey a wonderful place to read In Her Wake. My favourite beach is the one I spent every summer on as a child which was down the road from where we lived in Gorleston-on-sea in Norfolk. Whenever I get chance to go home to visit relatives I always go to my happy place sitting watching the sea and remembering those good old days especially the summer of ’76. Those were the innocent days of Punch and Judy, fish and chips and nobody batting an eyelid that a 10 year old girl would spend all day at the beach on her own! Can’t wait to read this book-i don’t think I have seen a bad review yet!! Congratulations Jo – after carefully adding all the names to the (virtual) hat, yours came out! Can you drop me an email with your address and I’ll get the book in the post to you. Enjoy! But the best beach and view we ever had was at the Edgewater Beach Hotel, got upgraded to a suite! overlooking the Gulf of Mexico. When we walked onto the balcony for the first time, the view literally took your breath away, absolutely beautiful. Then hubby went for a swim in the sea and some wild dolphins swam up to him, just a few metres away 😍. I had been very ill before we went and the holiday was the best tonic ever for the whole family! My favourite beach is Crantock in Cornwall. You know the feeling when you just sit somewhere and feel relaxed and completely at home.